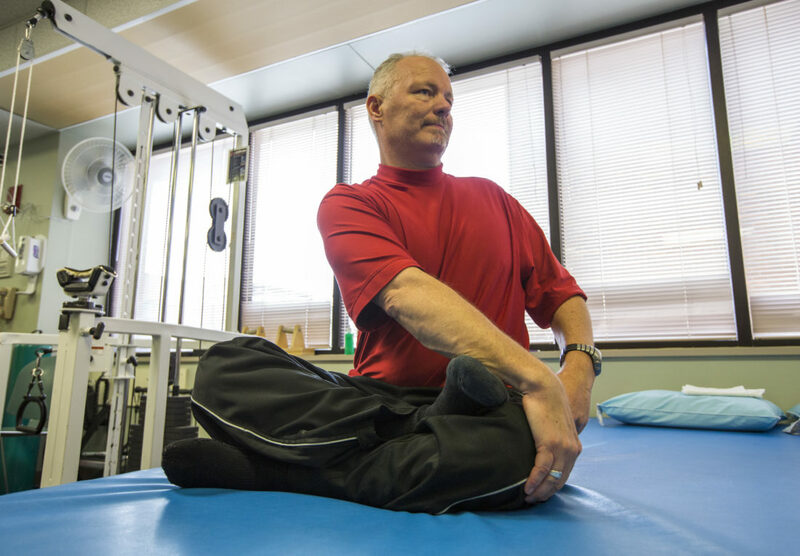 Rick McNabb, of Lawrence, stretches before beginning his routine of climbing steps at Lawrence Memorial Hospital. Four years ago, McNabb suffered an aneurysm which led to a stroke that left him paralyzed and without sensation on the left side of his body. McNabb is attempting to climb the equivalent of Mount Everest while raising money for charity. 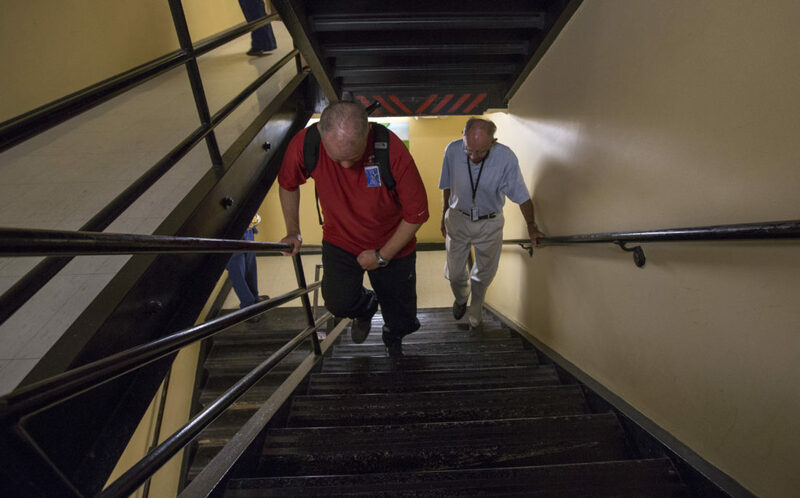 Rick McNabb, of Lawrence, left, climbs stairs at Lawrence Memorial Hospital in August while "coach" Jerry Waugh provides support and friendship. Four years ago, McNabb suffered an aneurysm that led to a stroke that left him paralyzed and without sensation on the left side of his body. 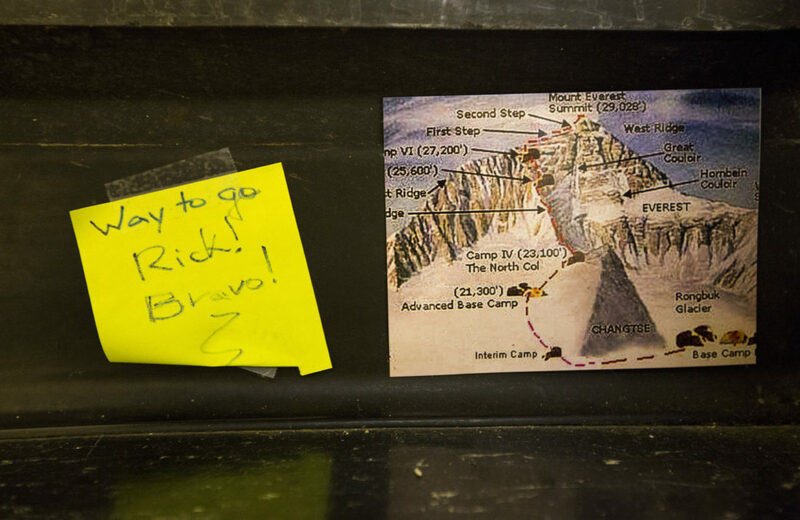 At the top of each flight of stairs, Rick McNabb leaves a picture of Mount Everest as encouragement and motivation to help him reach his goal. Sometimes, others leave notes to cheer Rick on in his quest, such as this one that reads, "Way to go Rick! 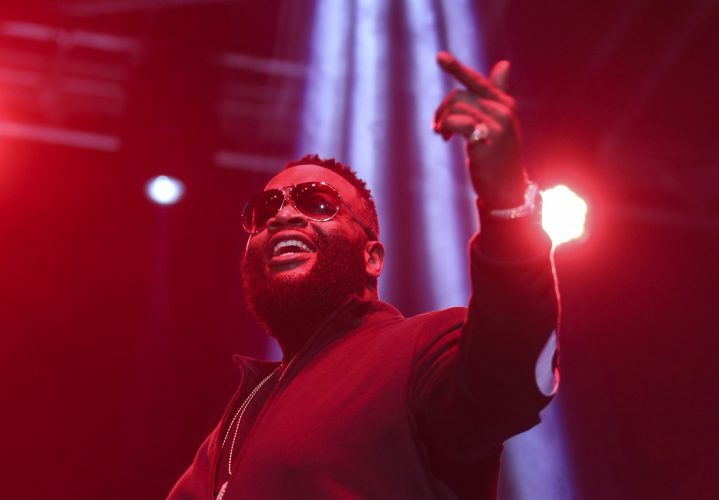 Bravo!" 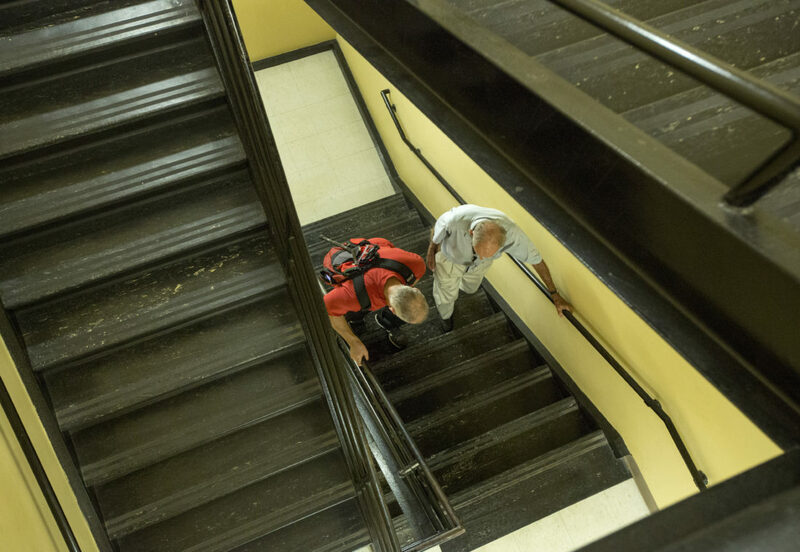 Rick McNabb, of Lawrence, left, climbs stairs at Lawrence Memorial Hospital on Friday while "coach" Jerry Waugh provides support and friendship. 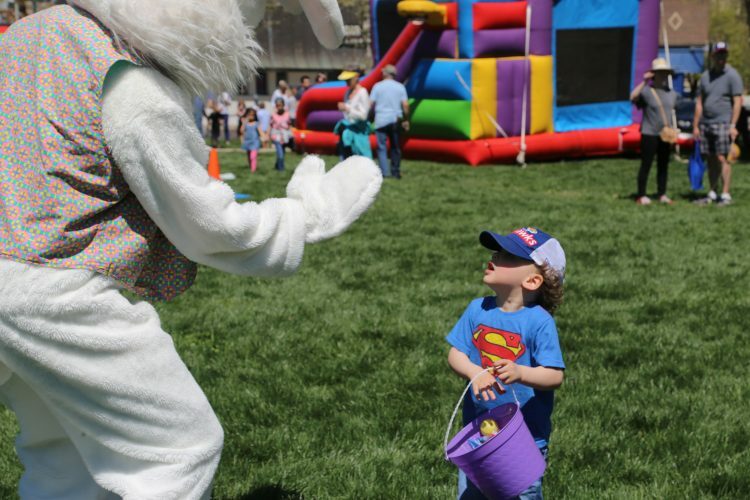 Four years ago, McNabb suffered an aneurysm that led to a stroke that left him paralyzed and without sensation on the left side of his body. McNabb is attempting to climb the equivalent of Mount Everest while raising money for charity. 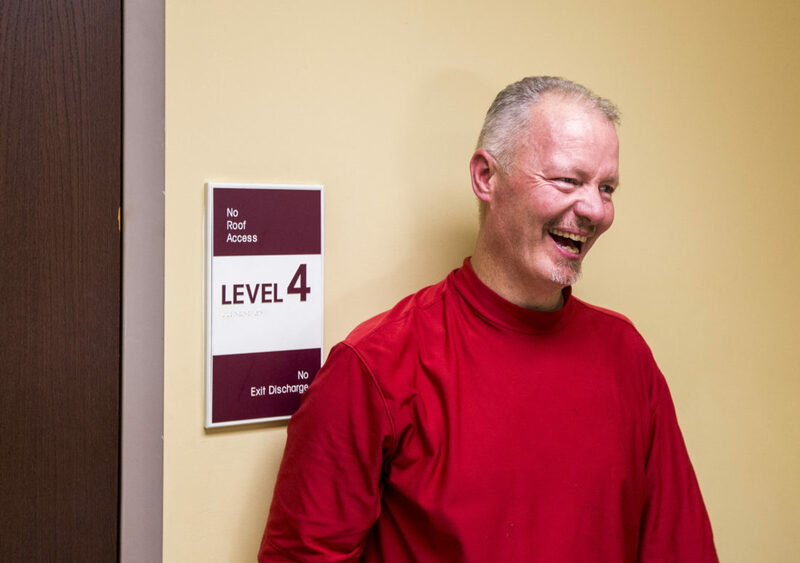 Rick McNabb has a laugh between climbs inside the level four stairwell entrance at Lawrence Memorial Hospital. 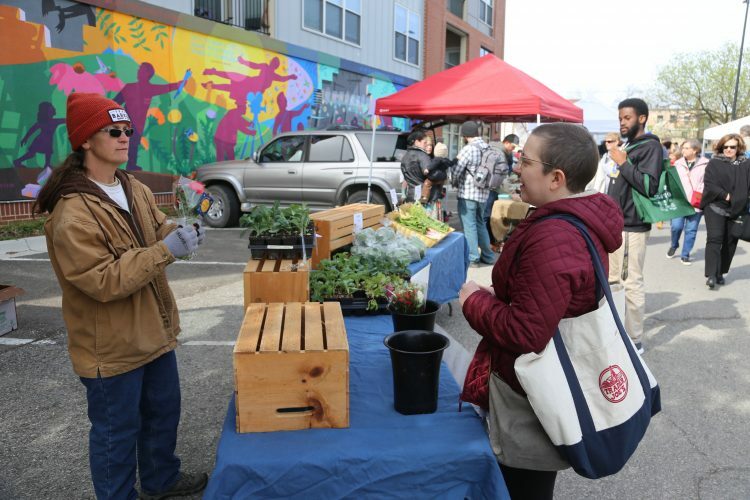 McNabb spent a month rehabbing on the fourth floor of LMH four years ago after suffering an aneurysm that led to a stroke that left him paralyzed and without sensation on the left side of his body. McNabb is attempting to climb the equivalent of Mount Everest while raising money for charity.